Tolson shares his success story at a recent recruiting luncheon attended by students and agents from Houston and across the Southwest. 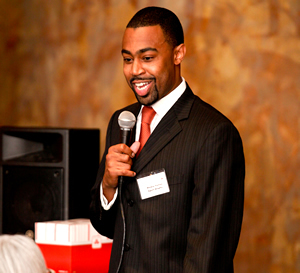 When Markus Tolson graduated from the Program for Excellence in Selling at the University of Houston C. T. Bauer College of Business, he had a tough decision to make — take a job that offered immediate rewards, or take a job that had tremendous potential for growth. He chose the latter. As he soon learned, a high performance work ethic put him in the driver’s seat. Today he is one of the top producers among new agents at State Farm Insurance. To get there, he started from the ground up working as an outside sales person for an industry veteran and well-respected agent, James Banks. An industry leader and renowned for its training programs that give agents tools to succeed, State Farm offered Tolson the foundation to learn every facet of the business and Bank’s tutelage was invaluable. To accelerate his goal of opening his own business, he made lifestyle adjustments. He continued to live at home with his mother and drove a 10-year-old vehicle in an effort to put away as much as possible for his dream. During the three years he worked for Banks, he saved tens of thousands of dollars, built up his credit and learned the ins and outs of the insurance business. He also built relationships that formed the backing and support he still relies on today. “I stayed motivated by focusing on the bigger, long-run picture. I knew if I could hold out, I could later reward myself with luxury items and things on my wish list that I had always wanted, like a new home,” he added. During his first few months running his own agency, his office was a top producing office in auto policies, life policies and bank applications and set what appears to be a new agent record for Texas. Clients, friends and family are not surprised by Tolson’s success. They say his approachable personality is magnetic, and his humble attitude and genuine interest in others makes it easy to want to work with him. And indeed, humble best describes his feelings when he first found out about his office’s record breaking performance. 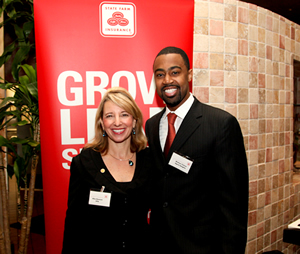 Tolson catches up with Rita Howard, Vice President Agency for State Farm Insurance. Howard has cultivated a strong partnership with PES and kept ties to Bauer strong. Tolson said he wasn’t always the type of person with the confidence to go after such an ambitious goal. In college, it took him awhile to figure out what he wanted to do with his life. When he decided his intended major was not for him at the end of his sophomore year, he sought the advice of a UH guidance counselor. Up until that point, he describes himself as a shy, quiet student. His short period of time in the sales program groomed him to be the outgoing, tenacious person that helps him succeed in his field.